By Janet Lembke. 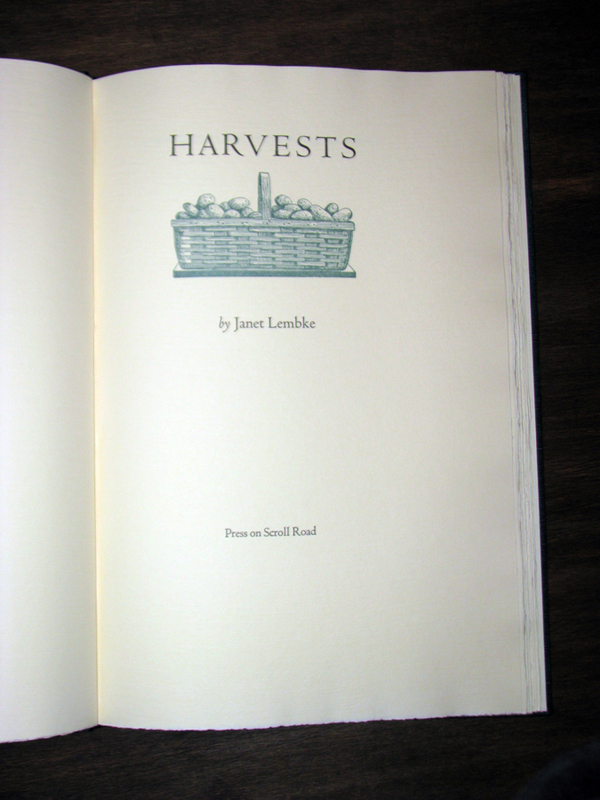 Harvests was printed from handset Cloister Lightface type on Frankfort Cream paper in an iron handpress. It includes an illustration by Joe Nutt, the author's brother, and a versal by Jerry Kelly. The sheets have been bound by Priscilla Spitler. First Edition. 12.375" x 8.25", 40 pages, fifty-four copies. $250.00. Out of Print. The author writes, gardens, and keeps cats in Staunton, Virginia. Her eighteen books include poetry, literary translations, and collections of essays on the natural world. In 2005, she received a grant from the National Endowment for the Arts to translate Virgil's Georgics. She is a certified Virginia Master Gardener.